Hanoi (VNA) – Visiting Lao officials have expressed their hope that the Vietnam Dairy Products JSC Company (Vinamilk) will consider seeking opportunities to extend investment in and exports to Laos. 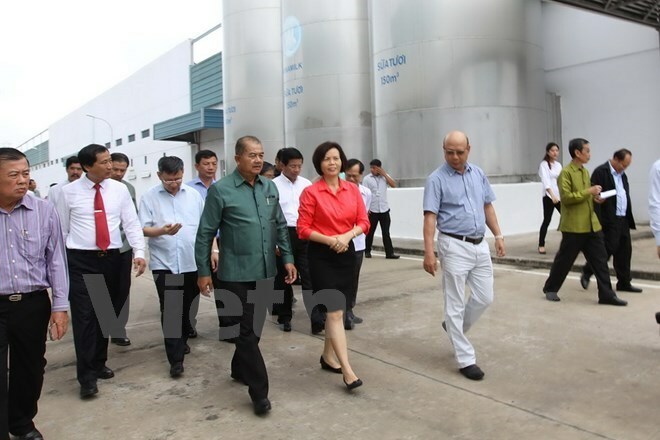 Head of the Lao Party Central Committee’s Commission for Propaganda and Training and President of the Lao Academy of Social Science Kikeo Khaykhamphithoune expressed the hope while visiting the Vietnam Dairy Products JSC Company (Vinamilk) in the southern province of Binh Duong recently. Vinamilk Executive Director Bui Thi Huong briefed the Lao guests about the firm’s business operations, including exports. Lying on the site of 20ha at My Phuoc 2 industrial zone, Vinamilk’s Mega is the largest dairy manufacturing plant in the country. With a total cost of 2.4 trillion VND (104.3 million USD), it has a designed capacity of 1.2 million litres per day in the first stage. The figure will double to 2.4 million litres per day in the second stage. With a closed and automated production line, its manufacturing process meets GMP and stringent international standards on food quality and hygiene and environment protection. Vinamilk now boasts 13 farms across the country with cows imported from Australia, the US and New Zealand, which are the first in Southeast Asia to meet Global GAP practices. Its organic milch cow farm in the Central Highlands city of Da Lat, inaugurated in March 2017, is the first one in Vietnam to meet European organic standards certified by the Netherlands-based Control Union. Currently, Vinamilk has more than 120,000 cows, which produce some 750 tonnes of material milk for 3 million glasses of milk per day. The company plans to increase its herd of cows to 160,000 in 2017 and 200,000 in 2020. Its daily fresh milk output is estimated at 1,500 – 1,800 tonnes in the next three years.